We hired Morgan consistently as one of our most reliable and desired talent. Our clients loved her. She can handle almost any delivery needed and on the first take usually! She is easygoing, reliable and a pleasure to work with as well. I highly recommend Morgan to anyone needing a true professional on-air talent. I have seen Morgan in action. She is a brilliant Actress, Host and Spokesperson. She is adaptable and flexible with whatever is thrown at her. Amazing to learn with, work with, and to know. I am a full time Actress, TV Personality, Journalist, Brand Representative, Lifestyle Model, and Voice Over Artist. During my 17 year career, I have appeared as a principal actor in over 900 commercials, infomercials, and industrials; as well as numerous print campaigns. I have had speaking parts in eleven feature films, and have hosted 19 television shows, including a live talk show. 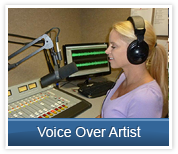 I am a highly accomplished Voice Over Artist with a studio in my home. I also have extensive experience in live performances and presentations; including home shopping networks, and events for companies like JC Penney, Sunglass Hut, Cosmo Girl Magazine, Seimens Global and MTV. I am currently a News and Political Contributor for Newsmax Media, a national network in the style of CNN, available on Dish Network, Direct TV, and streaming live on newsmax.com. This is very exciting as it allows me to put my Journalism background to use interviewing some of the most fascinating newsmakers and policy shapers about a wide variety of current topics in a live format. I have also hosted shows on national and international networks like Fox, Lifetime, NBC, The Food Network, The Beach Channel, the Dish Network and Sky TV, just to name a few. As a brand representative and corporate spokeswoman I have worked for companies like Microsoft, Ford, Canon, AutoNation, Carnival Cruise Line, Wyndham resorts, CVS and 7-11, along with many other distinguished companies and services. 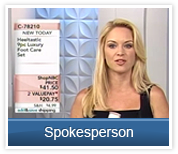 I have been using a Teleprompter, IFB, and Ear Prompter throughout most of my career, but I am extremely flexible, and great with Improvisation and Interviews. I am a team player and I can help with every part of the production process including scriptwriting. I bring my passion and experience to every project I work on and I hope my next project is yours! Please take a look around my website. Watch my Demo Reels, view my Photo Gallery and Resume, and for some fun, check out the Behind The Scenes Section.